Why theater? : Theatre is a release, an expression, an opportunity to entertain and educate. Tell us about Have Yourself a Very MARTI Christmas: I am a comedic drag artist who lives to make people laugh. 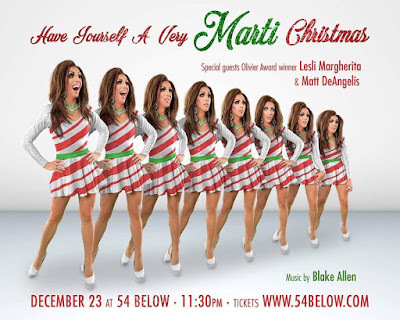 What inspired you to create Have Yourself a Very MARTI Christmas? : Being born. What kind of theater speaks to you? What or who inspires you as an artist? : All theatre has its place and it really depends on my mood and what the atmosphere is. Any roles you’re dying to play? : The emcee in Cabaret. Who would play you in a movie about yourself and what would it be called? : I would play me and it would be called "Hello Dear, Its Me." What show have you recommended to your friends? : The Color Purple is the greatest show on Broadway everyone should see it. What’s your biggest guilty pleasure? : Eating Sun Chips in bed at 3am.